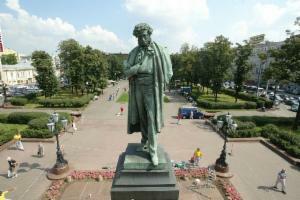 Alexander Pushkin was born in Moscow on 26 May 1799. His father, Sergei Pushkin, came from an aristocratic family and his mother, Nadezhda, was the granddaughter of Abram Ganibal, a young African who was educated and ennobled by Tsar Peter the Great. Despite all this French he also grew to love the Russian language and that was probably due to the influence of his grandmother, Maria Ganibal, and his nanny, Arina Rodionovna. Maria Ganibal spoke only Russian. She lived with the family when Pushkin was a child, spending a lot of time with her grandchildren, and he loved to hear her stories of their family history. Arina Rodionovna also spoke only Russian and she told him Russian fairytales. Pushkin wrote about 130 poems when he was at school, including My Portrait. Everyone could see how talented he was – friends, teachers and the school's many important visitors. As part of the school exams when Pushkin was 14 he recited one of his poems in front of the most famous poet in Russia, Derzhavin. Derzhavin was completely bowled over when he heard Pushkin, realising that the boy was a wonderful poet. He burst into tears and asked to meet Pushkin – but Pushkin was so nervous he had run out of the room at the end of his poem. The story is that Derzhavin exclaimed “I have not died! This is Derzhavin’s successor!” (though actually he may have said that later). The Russian artist Ilya Repin later imagined the scene in his painting "Pushkin at Tsarskoe Selo" . Pushkin left school in 1817 and went to work in the civil service in the Russian capital, St Petersburg. Poetry was still the most important thing in his life. He spent a lot of his free time going to the theatre and meeting other writers at clubs called “Arzamas” and “the Green Lamp”. His friends included many who were involved in a political group which was later known as the Decembrists. They were a group of officers who disagreed with the very harsh political system at the time. They are called Decembrists because they had an armed revolt in December 1825 to try to stop Tsar Nicholas coming to the throne. Pushkin wrote Ruslan and Ludmila at this time, a number of beautiful lyrical poems, and also some very political poems like Freedom. This starts with the declaration “I want to praise Freedom, I want to attack the evil of kings” and calls the tsar “Wicked autocrat!" By 1820 the government had decided his poetry was dangerously subversive. They sent Pushkin out of the capital and into exile in the south of Russia, 1700 kilometres from his family and friends in St Petersburg. 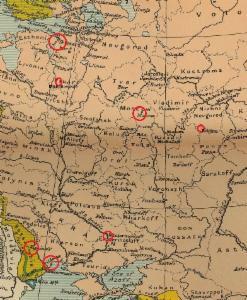 He was sent first to Ekaterinoslav (now Dnepropetrovsk in Ukraine) and then to Kishinev (now Chisinau in Moldova), moving to Odessa (now Ukraine) in 1823. Evgeny Onegin is a poem-novel about a frivolous young man from the city who has to move to the countryside for family reasons. He treats a girl there very badly and later bitterly regrets his behaviour, realising he is in love. The poem was made into an opera by Russian composer Tchaikovsky in 1879 (trailer), a ballet by John Cranko in 1965 (2013 premiere at the Moscow Bolshoi Theatre), and a popular English-language film Onegin in 1999. At the end of 1825 Tsar Alexander 1 died and in the following year his successor Tsar Nicholas 1 freed Pushkin from exile. Pushkin moved back to central Russia, living some of the time in Moscow, some in St Petersburg and travelling a lot. He became interested in the reformer tsar Peter the Great (1682-1725) and dedicated historical work to him. At this time he also became interested in his own family history and wrote a story Peter the Great's African based on the life of his ancestor Abram Ganibal. This was a busy time. Pushkin started work in a government office again and was allowed to read historical documents in the archives which inspired him to work on historical projects. Meanwhile Natalia was thought to be the most beautiful woman in the capital and was invited to all the high society balls. The couple had four children – Maria, Alexander, Grigory and Natalia. 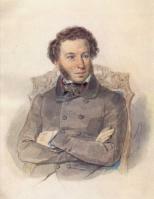 In 1836 Pushkin was fully occupied by editing the The Contemporary magazine which published the work of the best Russian writers including his own work. Despite all this Pushkin was not happy. There were many reasons – among them growing debts, problems with editing the journal, the lack of understanding from the public and the deaths of friends. The last straw was the fact that a French officer called Georges D’Anthes was flirting with his wife. Pushkin was very angry and to defend his honour he challenged D’Anthes to a duel. Who is your favourite writer - in English or any other language? What do you know about their life? In what ways was Pushkin's life similar, and in what ways was it different? Paint a portrait of Alexander Pushkin illustrating any of the events in his life. 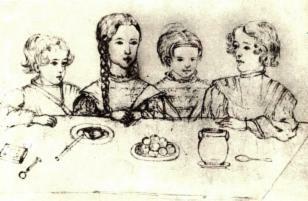 Imagine Pushkin and his friends at school and draw a picture of that. Listen to Stephen Fry reading Evgeny Onegin here (or read it yourself) and retell the story as simply as you can. Did you enjoy it? All these names (of people and places) appear above. Use our Russian alphabet to work out what they say. Can you remember who, what or where they all are? What can you find out about Pushkin's African great-grandfather Abram Ganibal? Who was Napoleon and why was he at war with Russia? Who were the Decembrists? What were the names of their leaders? What didn't they like about the way the tsar ran Russia? What happened to them? What is a duel? They weren't always fatal and Pushkin had taken part in duels before 1837. Can you find out anything about that? How common was it in those days? What happened to his children? Does Pushkin have any descendants?